With increased understanding of the interconnection of our world and our unique experience of it, we have an opportunity to wonder in awe and in empathy with the shared systems and forms of what we understand as reality. Through our human senses we experience a fraction of the make-up of our universe. Other organisms have their own unique adaptations in order to sense aspects of reality to which we, as humans, are oblivious. We share this special place in this universe, this galaxy, this solar system, this planet, this continent, these islands with a remarkably rich and diverse array of life forms that have their own relationship to and understanding of the reality of this space and this moment. By engaging our capacity for imagining what another being experiences, our empathy, we might shift our perspective to include a fuller picture as we consider the ways in which we have, do, and will connect, communicate, and share the world and its sustaining energy with all of the denizens of this jewel. In many ways we live at a unique time and place to witness an increasingly dichotomous threshold, the liminality between the relatively slow and interlaced evolution of the natural world and the fast paced technological evolution of human development. Our cultivation and exploitation of the planet's resources and the effects of these methods are dramatically contrasted in this micro island ecosystem where it takes very little action to make significant changes. With the installation, Liminal Currents, I sought to express an imagined conception of the nuanced underwater world as it may be visualized by an animal such as the resident orca, who uses sound to understand spatial relationships within its environment. As I have observed the turbulence of our dancing waters during a max ebb or flood I have wondered of the dynamics that are taking place below the surface, and picture an experience that allows a vision of subtle changes in the water column such as temperature differentials, saline and particulate densities, or current speed and direction. 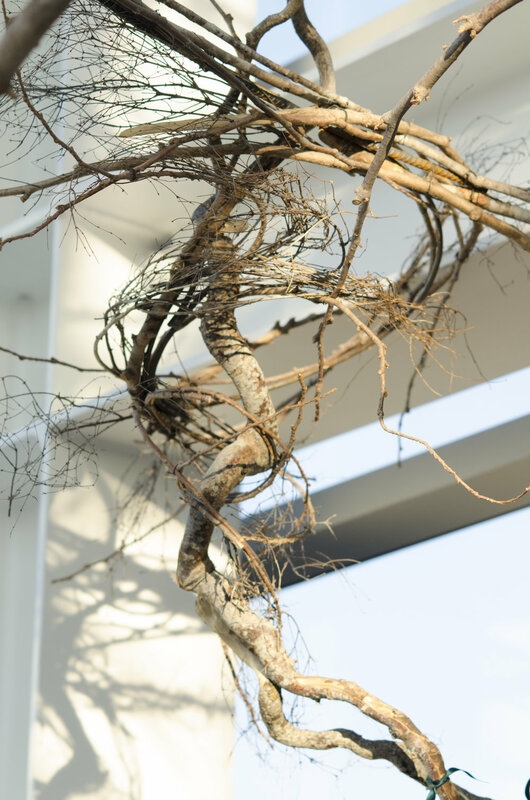 This imagining was expressed by creating a three-dimensional line drawing using cedar branches as marks made in the volume of the IMA atrium. The intent was for the viewer to perhaps acknowledge that through imagination and empathy we have the ability to consider an experience of the universe other than our own and therefore reflect a more inclusive perspective on how we as individuals and as a species share finite resources and cultivate relationship to other life forms. As Islanders and visitors to these islands, this threshold is especially evident as the shared world of two sophisticated species interface. In addition to the volumetric linear forms, a sound design was composed by Chuck Palmer, an accomplished, Grammy nominated musician and producer, to add an audible dimension to the immersive quality of the installation. The interlaced sounds evoke a dialogue between both human- and orca- generated sounds of movement and cultures concurrent as two intelligent, social and emotional species evolve, develop and adapt to shifts in the planetary systems on which both share and depend. Chuck has released the sound design under the artist pseudonym Anonymous Elder and it is available from iTunes and Amazon. Thanks to the incredible efforts of the Salish Sea Hydrophone Network, www.orcasound.net, the sound design includes contributions from the local resident orca pods J, K and L.
There was an opportunity for the public to contribute an element into the installation by bringing their unique perspective and personal reflections on what it means for them to be in this moment and place where they can make choices, dream new realities and introduce intention about how they want to live and share this world. If they chose to, they could write, or draw or otherwise express these sentiments on paper that had been provided, roll the paper and tie it with a ribbon that was then used to tie the message to part of the linear sculpture. Functioning as a kind of analog crowd sourcing, the density of messages accreted over the form and imbued the installation with an incredibly complex energy from the diverse range of content. The messages are not meant to be read but remain private. The value is in the energy that the process of expressing ideas, dreams, wishes and intentions hold. 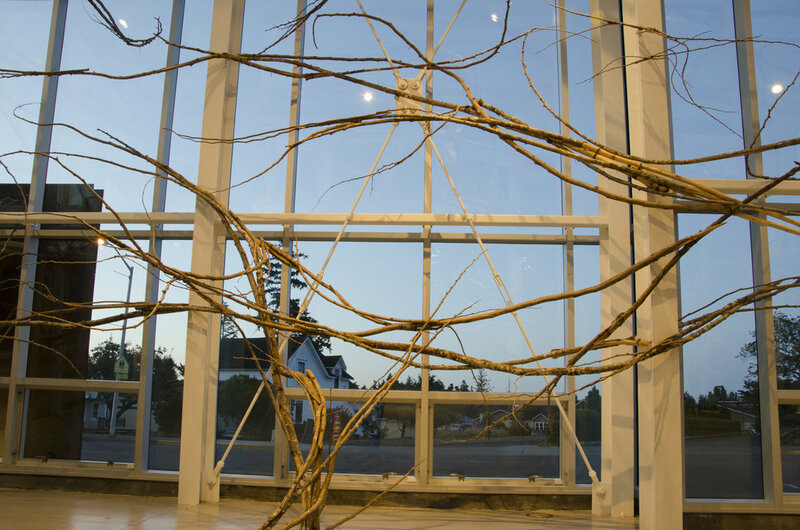 At the end of the exhibition, the branches were woven into a large floating nest. 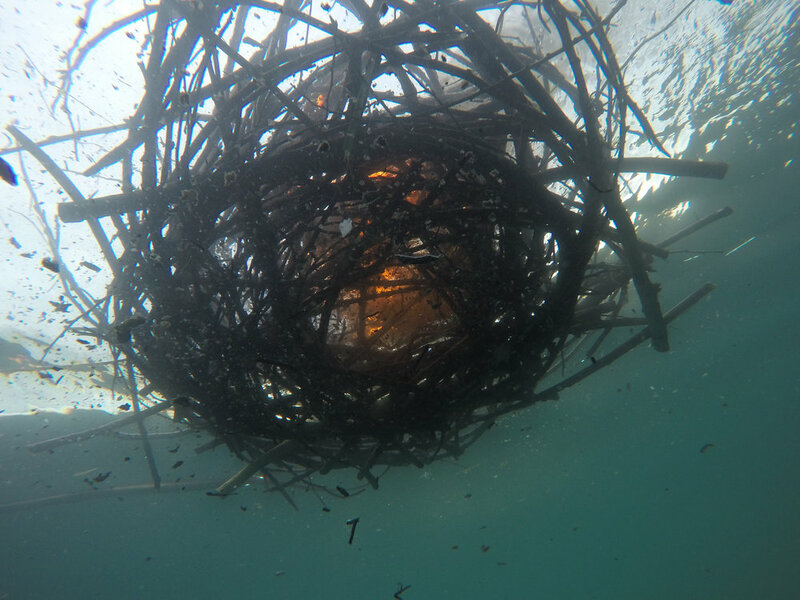 The messages were collected and carried by the vessel, ignited into flames after my assistant and I swam the dreams out to sea, transforming the scribed energy into light. The delicate ash drifted into the depths, carried along by the dancing currents.